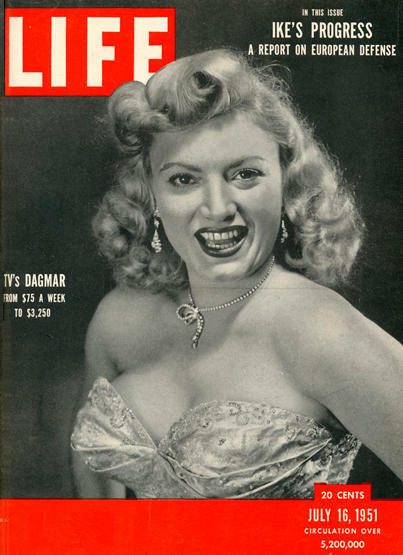 Dagmar was one of the most recognizable faces on television and even graced the cover of Life magazine. The entertainer known as Dagmar died on October 9, 2001. In the 1950s, she was one of the most recognizable faces on television and even graced the cover of Life magazine. She was born as Virginia Ruth Egnor in Logan County in 1921. At an early age, she moved with her family to Huntington, where she attended Huntington High School. During World War II, she moved to New York City and found work as a sweater model and Broadway actress. Her big breakthrough came in 1950, when she began appearing on NBC’s Broadway Open House. Audiences loved her deadpan delivery of punch lines and deliberate misuse of words. In one skit, she appeared as a character named Dagmar, and the name stuck. In her early career, she performed on stage with Milton Berle and Frank Sinatra. And, at one point, she was receiving 2,000 fan letters a week. In 1952, she briefly hosted her own series called Dagmar’s Canteen. She drifted out of the spotlight after the 1950s but continued to perform in nightclubs. Dagmar moved back to West Virginia at age 75 and lived her final years in Ceredo.